O Jesus, meek and humble of heart, make my heart like unto thine. From the desire to be honored, deliver me. From the desire to be praised, deliver me. that I might imitate the patience and obedience of Your mother, Mary. Note: This is not an easy prayer to pray, it comes from this book, in it Rev Morrow challenges us to pray this prayer. I have prayed it for over a year now. It really helps change our perspective on things. 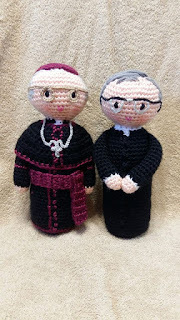 The photo is Saint Josemaria Escriva and Blessed Alvara del Portillo made by Oremus Crocheted Saints. I believe both of them would appreciate this prayer. For more info about the crocheted saints and a pocket oratory click here.